I’ve met two Presidents of the United States (POTUS, the now fashionably artless acronym via the Secret Service) and they both happened to be Republicans: George HW Bush and Ronald Reagan. I can say with as much confidence as I can name the day I was born that they were far less extraordinary than a lot of other people I’ve met. I was a nobody who happened to be making a living as a reporter, a more difficult practice these days than it used to be, which is another story, and more difficult to tell than this one. I don’t feel that I earned what I know about the two who appear in the paragraph above. I just happened to be in the right place when they exposed themselves. Reagan was Governor at the time, and I was at UC Santa Barbara working part time for an upstart weekly in Goleta. It was during the achingly slow march of the Board of Regents toward imposing tuition on students attending the world’s best free university. In August 1967 the weekly sent me up to UCLA to cover the meeting everyone knew would be the showdown between Reagan and The Board of Regents. The board – comprising people like Edwin Pauley (chairman of Standard Oil of California), Dorothy Chandler (wife of Otis, the owner of the LA Times and Catherine Hearst (wife of Randolph, heir to the Hearst’s newspaper empire) – had gathered in the faculty senate meeting room that morning to wait for Reagan before starting the meeting. The double doors swung open and 6 or 8 security people with wires in their ears swept in, taking up positions at the front, sides and rear of the faculty center before Reagan entered. University cops were there too. It was a year or so after the riots in Goleta, and a few more than that after the Free Speech Movement at Berkeley, so it was no surprise to see gunmen flanking a California Governor. What was surprising was Reagan’s ah-shucks, shambling kind of entry walk into the room; it played more Gomer than Governor. I could see his eyes scanning the room. They lit up when they landed on Dorothy Chandler, whose newspaper had already begun to gain the edge over the Hearst papers in LA and San Francisco, and went straight for her, bending down to give her a hug and say a few words. Then he went straight for Catherine Hearst, who was waiting for him on the other side of the vast table to administer the bowing and hugging Hearst must have been expecting. I got the feeling both women were genuinely thrilled by what was happening. They seemed almost to teeter, thrown off balance by the big boy, the best jock in their prep school. They weren’t actresses; he was an actor. The morning session wore on with no vote on what was being called a “fee,” a language waiver in deference to Reagan’s decision to abandon using the dreaded t-word, and for his agreement he’d approve using some of the income to fund scholarships for low-income students. The majority of tuition income, though, would have to go toward balancing the budget deficit that would occur under Reagan’s spending cuts. It had been known since March that Reagan wasn’t budging on the tuition issue, and more recently the vote was expected to come early in the first August session (Governors traditionally only attended the first day of the two-day Regents meetings). So the story was delayed. 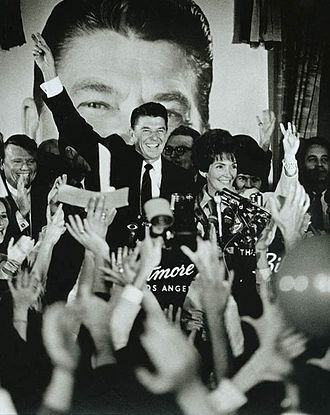 At the press conference, Reagan ducked his head and played humble. He wouldn’t say whether he or one of his allies on the board would introduce a tuition vote that day. In the absence of certainty, the questions were “what-ifs” about the possible impact of fees on who attended the university, whether “the fee” was tuition in disguise, and so on. It was a sort of tease. Upon reconvening in the afternoon, The Regents went right to the vote. Something must have happened over lunch. I hung on in the meeting while the reporters working for the afternoon papers broke for the exits, trying to reach their city desks with something for the same day’s paper. So did the TV people. By the time I got to the side room designated for press, where I could start putting together my story, I was almost alone in it. A cameraman was shooting Tom Brokaw, who then was still a pretty face working for the LA affiliate of one of the three national networks. Brokaw did his standup in a few takes. Then a funny thing happened. Brokaw sat down in a chair, adjusted himself and started asking questions to the camera that had been put by others at the press conference an hour or so before. Later, they’d be patched into his account as if he’d asked the questions. I don’t remember if anyone exposed Brokaw. I’m pretty sure Reagan didn’t. I don’t think either of them were better than the other. I think Tom Brokaw could have been as good a POTUS as Reagan. I’m pretty sure Tom Brokaw thinks so, anyway. We’ve always known Big Media is a necessary unit of political power. Back then its power was greater; a little less accessible to ordinary folk than it is now. Even so, it seemed to offer some promise it could live up to the belief “the truth shall make you free.” Also back then, the press and TV were commonly known as “the fourth branch of government” in the sense that information could expand democracy, enliven it. Press and television are now much more dependent on government, politics and financial entities for their content since the Supreme Court identified money as power, corporations as people, and the NSA identified people as suspects. So, now, the pretense and manipulation of the Reagans and the Brokaws is less necessary. Big Media, marketers, public relations people, NGOs, CEOs, lobbyists, professional associations, trade groups, IT and think tanks, financial institutions, insurance companies and others send their people in and out of government routinely. They are the fourth branch of government. The control of information, and the gathering of it has become so complete, so far-reaching and technically challenging that even a president is no longer the chief and only executive at the top of the hierarchy. It probably doesn’t matter if George W. Bush or Barak Obama is President. Or if Todd Gloria or Kevin Faulconer is Mayor. I remember attending a lecture by Eldridge Cleaver in the gym at UCSD at which he led he audience in a cheer: “F**k Ronald Reagan, F**k Ronald Reagan.” Over and over again. All the blue haired old ladies got up and headed for the exits. The Press as “the Fourth Estate” (a term coined by Edmund Burke) is NOT the same as being a fourth “branch of government.” The political purpose the press is to check, or control, the government. You oughta know that. I don’t much care for that diabolical icon you use, M-L. Could you get rid of it?